There are two key differences between these oil companies that will help you decide which stock is right for your portfolio. ConocoPhillips (NYSE:COP) and ExxonMobil Corporation (NYSE:XOM) are both large, international oil and natural gas producers. While they share many attributes, there are a couple of key differences. And those differences are what make one appropriate for conservative investors and the other for more aggressive investors. Here's what you need to know about these two energy stocks to decide which one is right for you. In 2012, ConocoPhillips decided to spin off its downstream operations. When it broke off Phillips 66, all of its pipeline and processing assets went with it, making ConocoPhillips a pure play on the upstream energy business. It still has to execute well throughout its focused oil and gas drilling operations, but the big change is that the prices of oil and natural gas are now the primary determinants of ConocoPhillips' success. This is the first, and perhaps most important, difference between Exxon and ConocoPhillips. Buying ConocoPhillips is a bet that is leveraged tightly to commodity price movements. If you think oil prices are heading higher, ConocoPhillips will provide you more direct exposure than Exxon. That same exposure exists if prices fall, though, which is where the second big difference comes into play. ConocoPhillips targets a dividend payout of around 20% to 30% of its cash from operating activities. When oil prices have been heading higher, like they have been recently, the dividend will rise. The dividend was increased 6% in 2017 and roughly 10% in 2018. That's the upside potential here. But that has to be juxtaposed against the risk of dividend cuts if energy prices fall, like they did in mid-2014. That drop led ConocoPhillips to cut its dividend a massive 66% in 2016. In the end, ConocoPhillips stock is really most appropriate for investors looking for direct upstream oil and natural gas exposure. But you have to be willing to accept the risks inherent in that decision. Exxon's business is also tightly tied to the ups and downs of energy prices. The upstream segment of the company accounts for the bulk of its operations, but not all of its operations. It also owns downstream businesses including refining and chemicals production. These operations tend to perform relatively well when oil prices are falling, because the cost of their feedstock (oil) is going down. So, improving prospects in Exxon's downstream operations provides a valuable offset to the falling energy prices that hurt results in the upstream business. More conservative investors looking to buy an energy stock would be better served by Exxon's more diversified portfolio of assets. The proof of that is in the dividend, which Exxon has increased every single year for 36 consecutive years. That's an incredible streak for a company that operates in a commodity industry subject to often volatile price swings. And it's the second key difference between the two companies. 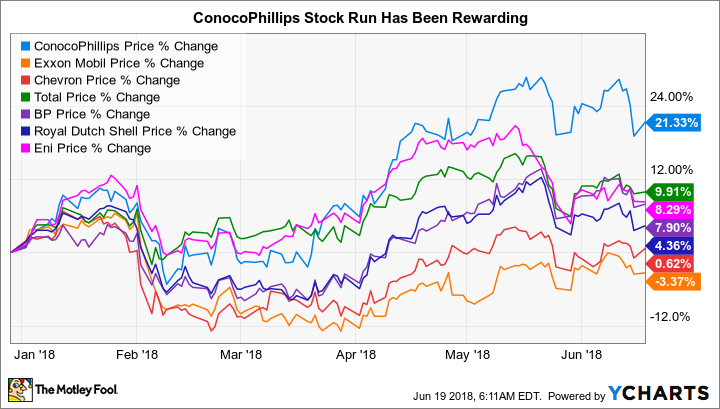 If you are an income investor, Exxon's long history of rewarding investors with annual dividend hikes is probably a better option than ConocoPhillips' inherently variable dividend. The big problem for Exxon today is that it hasn't been executing particularly well lately on the upstream side of its business. Oil production has declined over the last couple of years (down 3% between 2015 and 2017), and return on capital employed has fallen to the middle of the pack compared to its integrated peers. The shares are down around 3% so far this year, while most of its diversified competitors are up in the mid to high single-digits. ConocoPhillips' stock price, for reference, is up around 20%. Notably, the upstream-focused company managed to grow production nearly 10% last year. Exxon is working to turn its business around, which will take some time because of the company's large size and conservative nature. But that opens up an opportunity for income investors, since the stock currently yields around 4% -- the high end of its historical range. ConocoPhillips' yield is only 1.7%. COP Price to Tangible Book Value data by YCharts. The divergent stock prices, meanwhile, have opened up another notable difference. ConocoPhillips' price to tangible book value is currently around 2.5 times. Exxon's is far lower, at roughly 1.8 times. 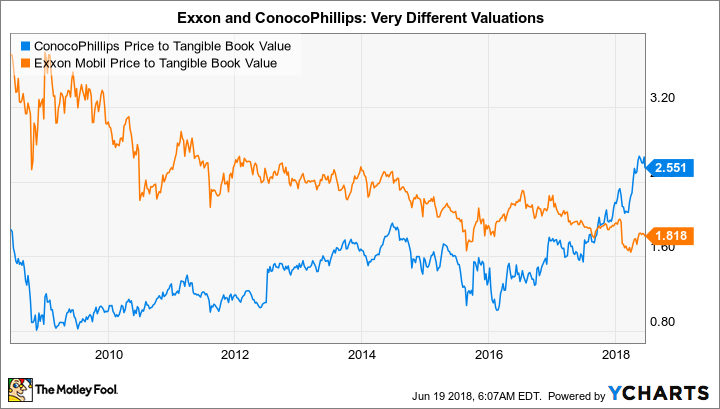 But the real issue here is that ConocoPhillips' price to tangible book value is the highest it has been in a decade, while Exxon's is the lowest it has been in a decade. As long as oil and gas prices remain strong, ConocoPhillips will continue to do well. If that's what you expect, then ConocoPhillips is a great option for you, but you are paying a fairly high price to participate in its success. If energy prices don't cooperate, meanwhile, the stock price could quickly fall. Exxon, on the other hand, appears to have a lot of bad news baked into its stock price. But that doesn't change the balanced nature of its business, or the fact that it is slowly working to right the ship. History suggests it will succeed in time. So, not only is it a better option for conservative income investors, it also appears to be a better choice for value investors, too.